Weather isn’t often an issue in Southeast New Mexico, where storm activity is generally light and unintrusive where sporting events are concerned. But when it intrudes, it does so with a vengeance, as was the case Thursday in Artesia. 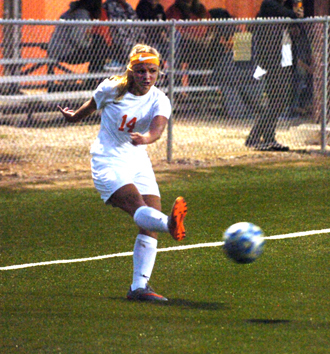 While the Artesia High School volleyball team was safe inside the Pit and the Bulldog soccer team able to continue past a lightning delay on the road in Alamogordo, the Lady Bulldog soccer squad had its intended bout against Alamo essentially reduced to a 31-minute scrimmage. Rain and lightning initially forced a nearly hour-late start to the game at the Mack Chase Athletic Complex, but as 7 p.m. approached, the Lady ‘Dogs and Lady Tigers were able to get underway. The two teams proved evenly matched early, creating similar scoring opportunities while jockeying for possession up and down the field. “This was the first time we’ve played as fast as that game was,” Lady ‘Dog coach Tim Trentham said today. “The teams we’ve played up to this point aren’t as quick and their game speed isn’t anywhere near the speed of Alamogordo, so I thought we did okay against that. Alamogordo was able to find the back of the net with 17:25 to go in the opening half, and Artesia was pressing for a potential halftime tie when, with 8:49 to go, the atmospheric eruptions returned. The officials corralled the teams in their locker rooms for what became an hour-and-a-half-long waiting game before it was finally decided the lightning was not letting up. Due to the contest not yet having reached the half, it could not be ruled a decision and will instead go down as a cancelled game. The Lady Bulldogs (5-3) will now prepare to cap off their busy week with 11:30 a.m. and 4:30 p.m. games against Deming and Santa Teresa respectively Saturday at The Mack. In between, at 2 p.m., the Lady Desert Warriors and Lady Wildcats will square off. The Artesia girls will also hold their Senior Day at 11 a.m. Saturday preceding the opener.